Does it surprise you to know that applicants to the Ivy League — even ones who don’t earn admission to one of the eight Ivy League institutions — earn more money than do students who don’t apply to Ivy League colleges? It shouldn’t. Students who even think of applying to the Ivy League have chutzpah. They’ve got audacity. They’ve got drive. At least the vast majority of them do — even the students who have low odds of ever getting in to any of the eight schools. It shouldn’t be surprising to learn that a group of students who apply to our nation’s finest universities do better in their careers than do students who don’t apply to our nation’s best universities. Much of career success, after all, comes down to chutzpah! Applicants to the Ivy League, like racers in Ironman events, tend to be a self-selecting group. To give you a better understanding of this phenomenon, let’s give you a similar scenario for you to analyze. Ironman races. Have you heard of the Ironman? If not, the Ironman is the most ridiculous of any triathlon. It is, in our estimation, one of the most absurd athletic feats one could ever attempt. There’s a slogan by which Ironmen live by…”You’re running a marathon? That’s cute.” The Ironman consists of a 2.4 mile open-water swim, followed by a 112 (often uphill) bike ride, followed by a 26.2 mile marathon. The marathon is simply the closing leg of the race. The race begins at 7 AM and ends at 12 AM. A finisher who completes the race at 12:01 AM, unfortunately, is not an Ironman. To be an Ironman, that racer must finish on the same day. If successful, that racer will have their name announced (i.e., “Age 34. From Colorado Springs, Colorado. 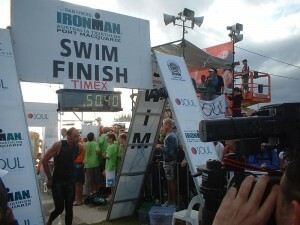 Nicholas Palmer, you are an Ironman.”). Anyway, what does the Ironman race have to do with our analogy, you ask? Easy. Those who even attempt to complete an Ironman are overachievers. They’re clearly overcompensating for something! Who would do that to themselves? Who would swim, bike, and run that much? You should see the tent after the race — there are hundreds of racers hooked up to IV’s…it’s nuts! The fact is that it’s a self-selecting pool just like the Ivy League applicant pool is a self-selecting one. People who don’t think they have a shot at all of getting in tend not to apply. They tend not to sign up for Ironman races either. Some do. But they don’t succeed. Anyhow, you get the idea.